Hi everybody! 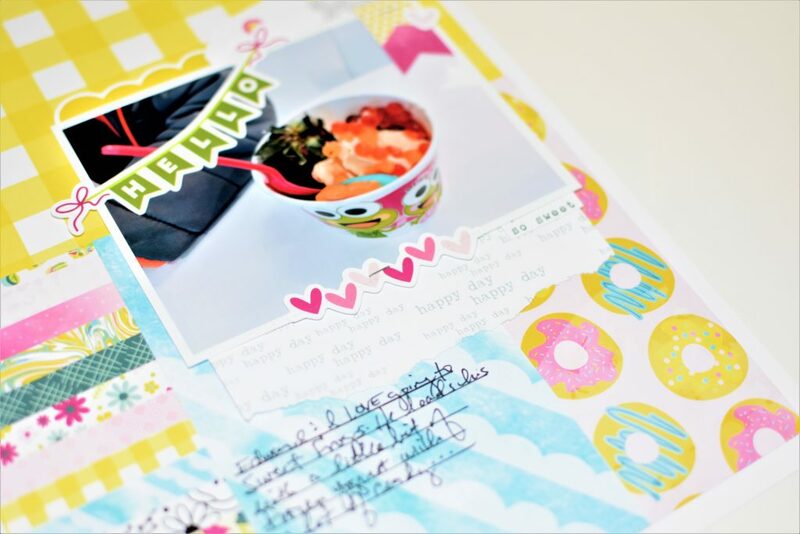 I’m back with another layout I created using the Sweet Life collection. This collection makes me so happy… the colors are so HAPPY! 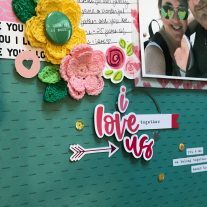 I had a picture from when Edward and I went to Sweet Frogs awhile back and thought it would go with the patterns and embellishments perfectly! For the bottom half of the layout, I used the cover sheet for the patterned paper pack since I wanted to use all of the patterns! 🙂 It saves me time and work from having to cut patterns into strips to use on the layout. And I hate throwing away paper… I try to use the packaging on my projects as much as possible. I cut the tag in half so I could trace the bottom half and use the top as a template. I like using two tags together… Then I added two banner flags from the cut-apart sheet and a die cut heart.